The media has gone to great lengths to carve society up into specific social groups. 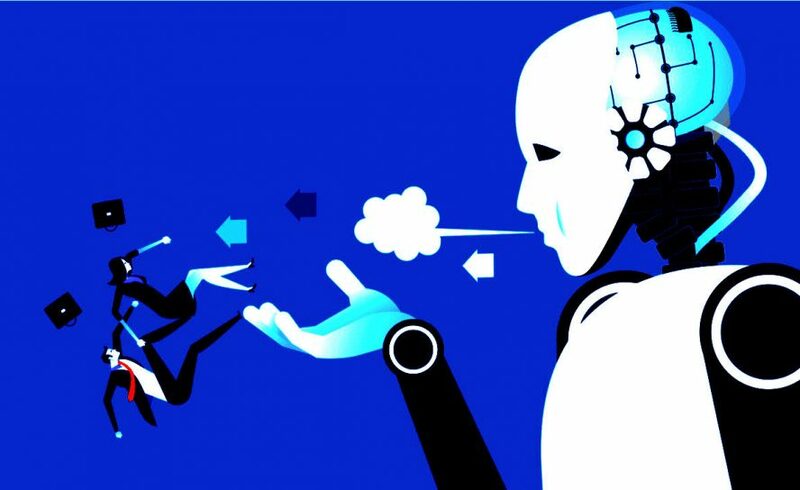 This is nothing new of course but for the first time, the technology evolving around us is having an effect on how we fit into the social fabric of the world around us. Baby Boomer or Millennial? Gen X or Gen Z? With the concept of a “Generation Alpha” already being proposed, is there a risk of alienating individuals – or whole sections of society – as they get shunted further down the groupings conveyor belt? So how are the groups made up and who do they most apply to? This is a group that was born before 1945 and inherits one of their names from the fact they were children of an era that were expected to be seen and not heard. In the 70+ bracket, they have mostly retired from the workforce, although those still in employment are usually partners, managers or senior support staff. Some will perform administrative roles on a part-time basis to keep themselves busy and active. This group usually share a hard work ethic and grew up during lean years following the end of World War II. They are considered the wealthiest group and are traditionalists, with a more cautious approach to life. They are seen as being the least tech-savvy of all the generational groups and consequently maintain a high degree of scepticism towards emerging technology. Born between 1946 and 1964, this group inherit their name due to the increased birth rate and “baby boom” which took place following the Second World War. The baby boomer generation makes up a substantial portion of the world’s population, particularly in developed nations and in the US alone represents nearly 20% of the American public. They are currently the longest-living generation in history and therefore at the forefront of what has been called the “longevity economy”. They continue to explore new lifestyles as technology and medical advancements open up more opportunities to them. However, they also often have the finger of blame pointed at them for orchestrating the difficulties most younger generations now have to deal with around debt, housing and career development. Baby Boomers are credited with having helped build an economy where young people increasingly need a college education to move into the middle class – even though they themselves did not. This group applies to those born between 1965 and 1980 and have been referred to as the neglected “third child” or the MTV generation. They currently occupy a substantial number of business leadership roles, grew up playing video games and now spend the most time shopping online. One recent report also credited them as using social media more than any other group. A survey conducted in part by CNBC also recently calculated that Generation X now accounts for 51% of the leadership roles in business. They are not digital natives but are nevertheless comfortable with technology and use it as part of their everyday lives. 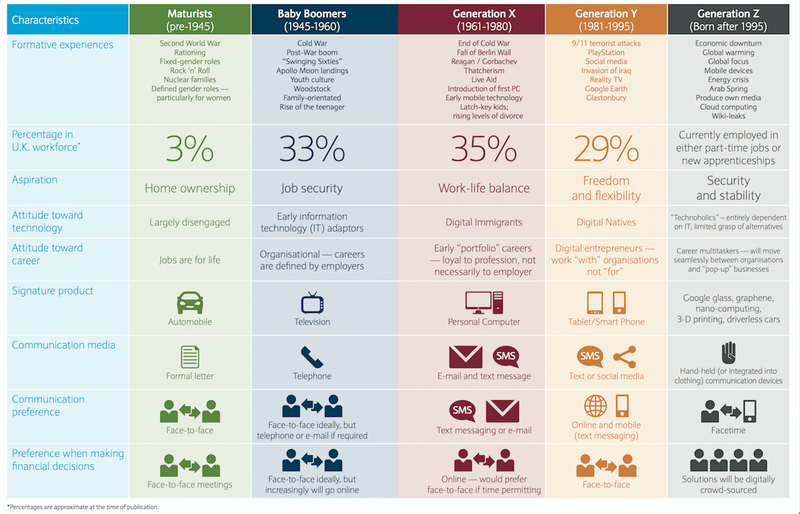 Nielson backed this up with a study that tended to suggest that Generation X are also the most connected of any group. Perhaps most surprising of all, they are said to use social media 40 minutes more each week than millennials and also most likely to stay on their phones at the dinner table, as well as spending more time on every type of device – phone, tablet or computer. Born between 1981 and 1995, this group is the first generation to have come of age in the new millennium – the Digital Native – but also struggles with the biggest burden of debt. A significant number still live with their parents and though they represent the target audience for businesses over the next twenty years, they appear to have the least amount of money to spend. Perhaps unfairly, they are often associated with an over-reliance on technology and social media but have certainly been heavily impacted by the most recent recession, which alongside the rise of technology, has affected them joining the workplace. Millennials have only ever known an electronic filled and networked world, the foundations of which were already being laid before they came to full maturity. They have been accused of narcissism and over-confidence but generally adopt a more positive outlook for the future, despite being predicted to be less economically successful than their parents. Millennials will ultimately shape the next phase of technological evolution but may not actually be the ones who benefit most from it. Anyone born between the mid-1990s and mid-2000s, this is the generation that found life during the recession and is now about to enter college or take its first steps into employment. They were born into a world already dominated by the internet and have a good grasp of technology and social media. In some countries they already have a larger presence than Millennials (in the US, for instance, they outnumber them by 1 million) but whilst the preceding generation were pioneers of the internet and created the likes of Facebook and smartphones, Generation Z has never known a life without them. Marketers are starting to consider this group as perhaps the most influential in the decades to come as they’ve grown up in an era when information has been available 24/7 so they are most tuned into how it works. The one risk is that whilst they can navigate the system they may not completely understand how the politics behind it works and this could leave them vulnerable to manipulation. There is another generation that is starting to take shape but it is too early to decide both how they will engage with the technology around them and how they will seek to exploit it. Tentatively labeled Generation Alpha, these are the post-2010 babies, those who were born with a smartphone in their hands and have an iPad as a babysitter. Are there any parallels that can be drawn between the respective social groups. I see some obvious similarities between Maturists and Generation Z; they both had to emerge from difficult periods in history and this has had a profound impact on their personalities. Baby Boomers and Millennials also bear comparison because they each took control of the world they inherited to help shape it, forcing change and encouraging diversity. But do these labels properly – and fairly – represent the state of our society or are they simply media tags that offer us easy targets to lay the blame upon? Is it another example of the ailing liberal agenda, with its constant worship of the “self”, having to accept that we do all fall into predictable groups and the concept of the individual will eventually be destroyed by technology. “I” becomes we and many become one. The world is changing and its direction – driven by AI and quantum computers – will be more focused and less diverse. One day, these labels will become a thing of the past. Championed by Generation Z and most probably Generation Alpha, who we are will be more about the collective than the individual. But, whilst it will help the human race evolve and survive, I can’t help feeling a pang of sadness for the day that sense of the individual is finally lost. Perfection is a wonderful pursuit but once we attain it, where do we go from there?